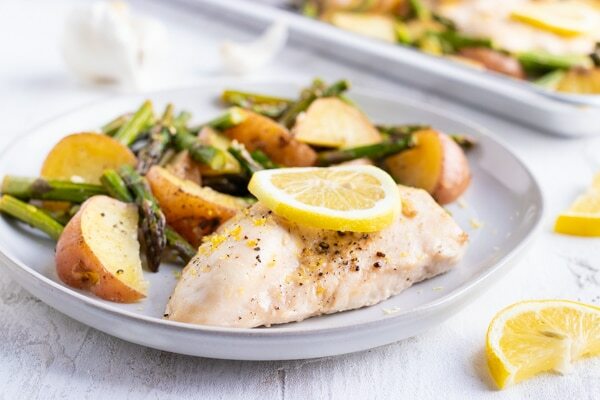 Lemon Garlic Chicken Breasts are oven-baked with asparagus and red potatoes for one of the easiest weeknight sheet pan dinners! Liven up your typical oven-baked chicken recipe with a healthy and zesty lemon garlic sauce made from fresh lemons, garlic cloves, and a touch of honey! 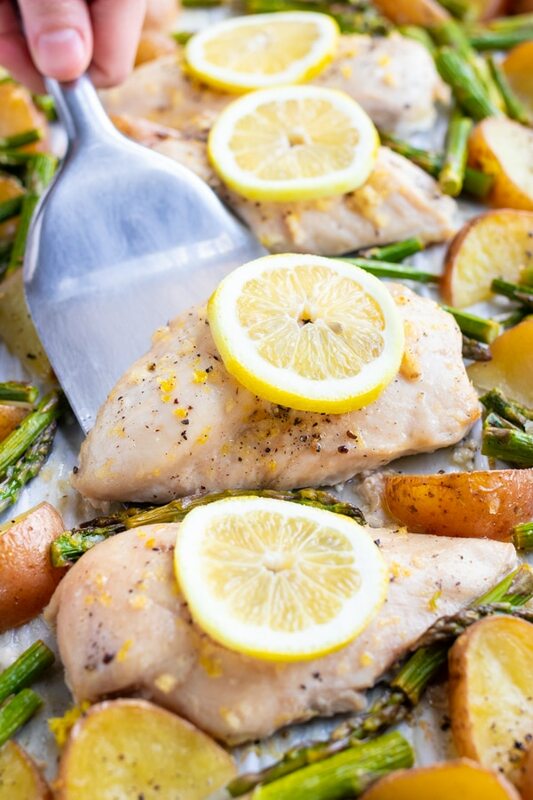 Want more baked chicken breast recipes like this Lemon Garlic Chicken and Asparagus? 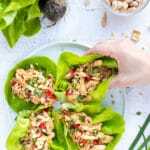 You might also enjoy these Oven-Baked Sheet Pan Chicken Fajitas and this Sheet Pan Thai Peanut Sauce Chicken and Veggies. 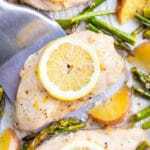 Lemon Garlic Chicken and Asparagus – Lazy or Genius? Oftentimes this consists of me throwing literally EVERYTHING I could possibly want to cook with on the kitchen counter to see if anything will remotely taste good together. This was exactly the case when this baked lemon garlic chicken breast recipe was born. 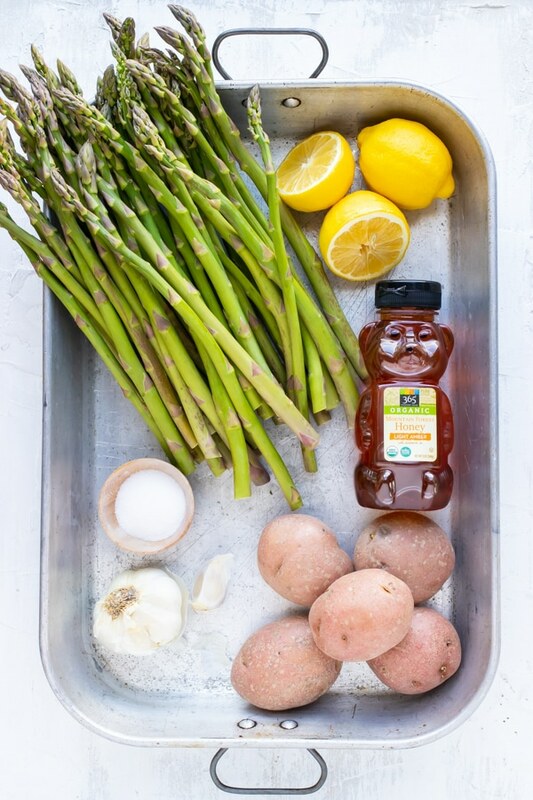 Originally my goal was to saute up the asparagus in a cast-iron skillet and roast the red potatoes separately…. Plopped them in some good ole’ gallon-sized ziplock bags (because who wants to clean even more dishes when your zonked and hangry) gave ’em a good toss, and baked it all in the oven. Not only was the chicken incredibly moist, tender, and delicious (more on my new organic chicken breast obsession below! 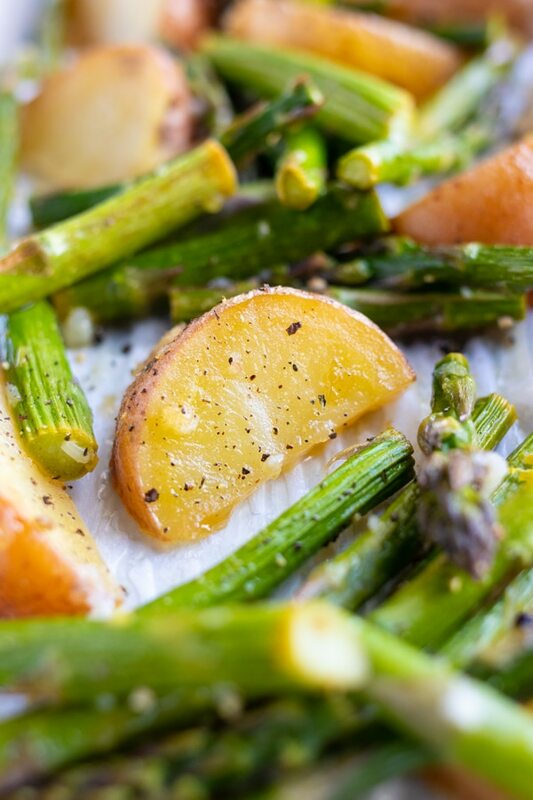 ), but the asparagus and potatoes were BURSTING with fresh lemony-garlic-goodness. 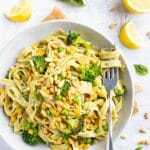 Below you will learn the ingredients in this lemon garlic chicken recipe, how to tenderize chicken breasts, how to bake chicken breasts, where to buy organic chicken breasts, meal prep instructions, variations to try, and how to serve, store, and reheat this lemon chicken recipe. As mentioned previously, the ingredients in this lemon garlic chicken recipe were all items I already had in my refrigerator or pantry one evening. Chances are, you will have the large majority of them, too! Chicken Breasts – One pound of chicken breasts are used in this recipe. 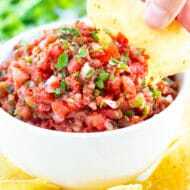 It is OK to get slightly more or less, but try to cut them into equal-sized portions that are about 4 ounces each. 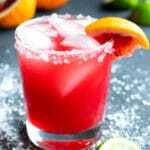 Lemon – Fresh lemon juice and zest are used in this recipe. Please do NOT get the kind in the bottle or skimp on the lemon zest. Have a microplane grater? This is the best utensil to use when zesting lemons in this recipe. 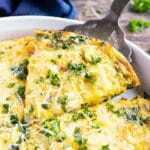 If you do not, use a normal zester and then finely chop the lemon zest so it is small enough to be evenly dispersed throughout the lemon garlic sauce. 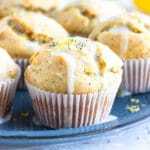 Garlic – Much like the fresh lemon, fresh garlic cloves are highly recommended in this recipe. Garlic powder will not give the sauce quite the same punch that fresh garlic cloves will. Use a garlic press to make crushing garlic a breeze. Butter – While butter and I go WAY back and I think it adds such a rich depth of flavor to this dish, I know that some of you are dairy-free and try to avoid it. If you are, feel free to use olive oil, avocado oil, or a vegan butter substitute instead. Asparagus – This nutritious vegetable is in season right now and is super easy to locate. Make sure you trim the ends until all of the woody stock has been removed. You can also achieve this by snapping the ends of each asparagus stalk. Red Potatoes – While their reddish-hued skin gives this sheet pan dinner a brilliant pop of color, Yukon gold potatoes will also work quite well. Before baking your lemon garlic chicken breasts and potatoes, you must first tenderize the chicken and cut it into equal portions. What is the best way to tenderize chicken? Pounding chicken with a meat mallet is the easiest way to get perfectly juicy and tender chicken breasts. Use a cutting board that is designated for meat and preferably not a wooden one since bacteria can seep into it. Place a piece of wax paper or parchment paper over the top of the chicken breasts. Using the flat side of the meat mallet pound each chicken breast 5-10 times, or until the chicken has been flattened to about 1-inch thick. If chicken breasts are quite large, cut into equal 4-5 ounce portions and continue with your baked chicken breast recipes. 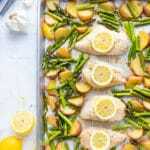 For this lemon garlic chicken recipe the oven will be preheated to 400 degrees at least 15 minutes before baking the chicken breasts and potatoes to ensure it has reached temperature. Bake the chicken breasts and potato slices for 15-17 minutes, toss in the asparagus, and continue baking for an additional 12-15 minutes, or until asparagus is cooked to your desired doneness. 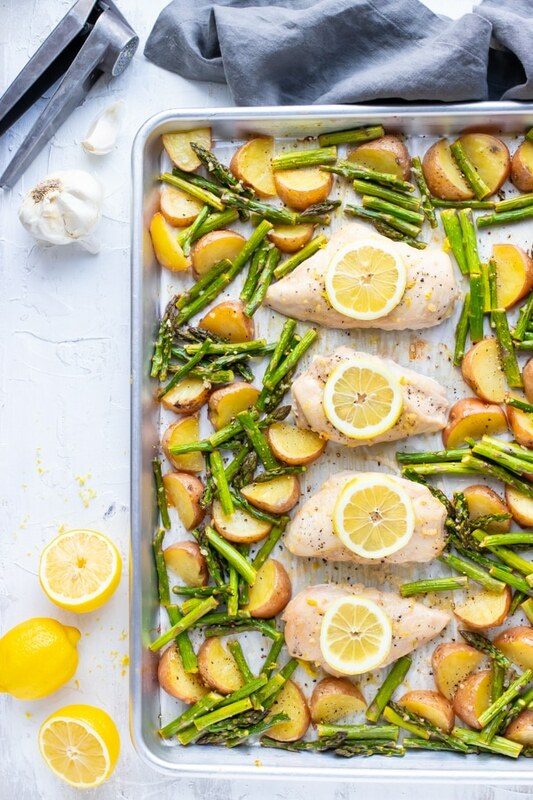 Since the sheet pan is quite full while cooking the chicken breasts, you will cook them for about 5 minutes longer than you normally would without the asparagus and potatoes. Between my husband and my mother-in-love I have learned A LOT when it comes to nutrition and healthy living. Some of the newest knowledge I have gained is in the field of eating organic meats versus non-organic meat. Having gone through dental school I understand the importance that over-consumption of antibiotics can have from a medicinal standpoint. Never had I actually considered how much I was getting from our foods purchased in the grocery store?!? While the price tags have always been a deterrent for me, as well as the fear of the meat tasting, well, um, natural… I have avoided hopping on the organic meat train for quite some time. That is, until recently. We have been buying organic chicken and meat from our local grocery store for almost a year now when I discovered Butcher Box. Not only is it SUPER convenient that they DELIVER the meat for you, but it actually tastes even BETTER than the organic meat I buy at our local store. They’re juicy, tender, flavorful… I seriously had NO idea chicken could taste this good. And the best part? You can actually pick and choose what types of meat you want delivered and change it up on a monthly or bi-monthly basis. 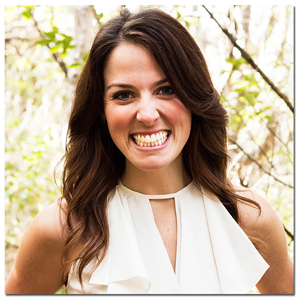 <– We opt for the bi-monthly since we try to limit how much meat we consume in general! One of the BEST parts about this baked lemon chicken recipe is how easy it is to prep-ahead or save some for later. Whisk together lemon garlic sauce and store it in an airtight container in the refrigerator for up to 3 days. Pound thin and cut chicken breasts into 4-ounce portions. 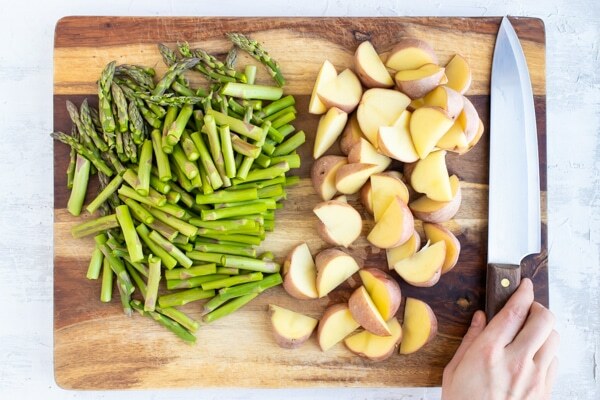 Cut asparagus into 2-inch strips and potatoes into wedges. Store potatoes in water for up to 24 hours and asparagus in an airtight container for up to 2 days. Heat up lemon garlic sauce when ready to prepare and follow the remaining directions below. 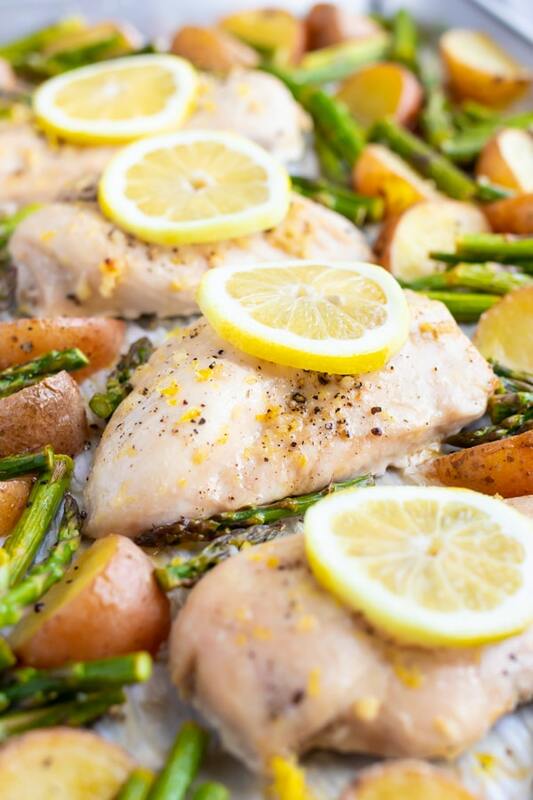 When ready to serve your lemon garlic chicken and asparagus simply let it sit for 5 minutes after coming out of the oven and serve with additional black pepper and lemon zest. Store any leftovers in an airtight container in the refrigerator for up to 3-4 days or in the freezer for up to 3-4 months. In a skillet over medium heat for 7-10 minutes. Or in a 300 degree oven for 10-15 minutes. Swap out the fresh lemons for limes or oranges. Use maple syrup or agave nectar in place of the honey. 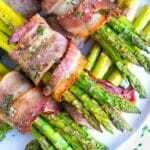 Broccoli and cauliflower would substitute wonderfully for the asparagus. Yukon gold potatoes, sweet potatoes, or russet potatoes can be used in place of the red potatoes. 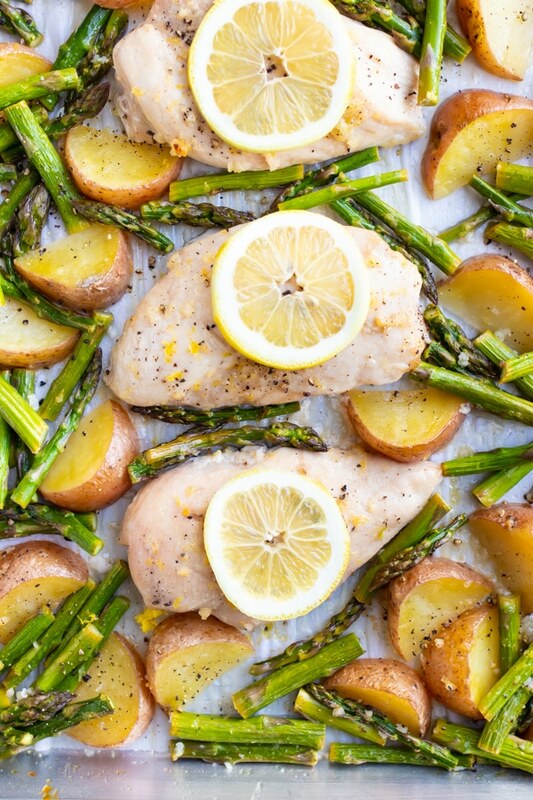 Lemon Garlic Chicken Breasts are oven-baked with asparagus and red potatoes for one of the easiest weeknight sheet pan dinners! Prepare chicken by pounding with a meat mallet until 1-inch thick. If you have large chicken breasts, cut them into four equal 4-ounce portions. 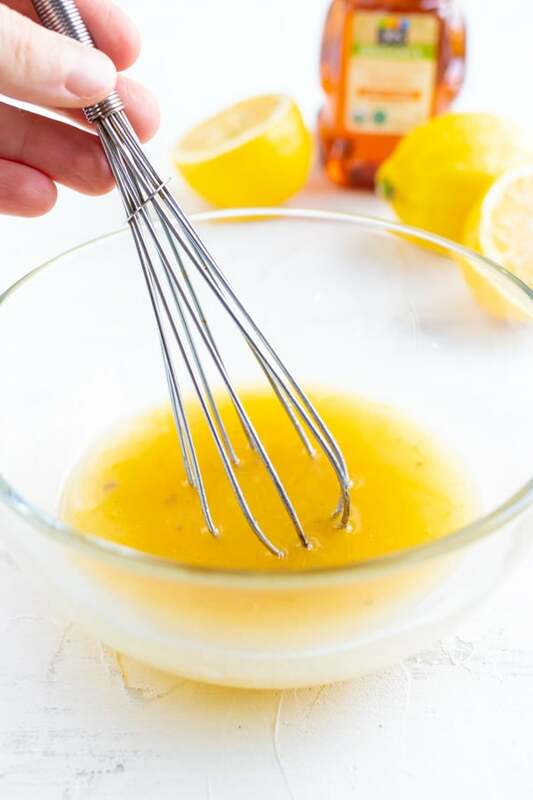 In a medium-sized bowl whisk together butter, lemon juice, lemon zest, garlic cloves, honey, salt, and pepper. 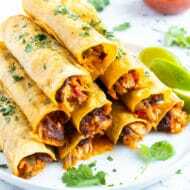 Place chicken breasts down the center of a parchment paper-lined baking sheet and brush 2 tablespoons of the sauce over the breasts with a basting brush. Place potatoes in one gallon-sized ziplock bag and asparagus in another gallon-sized ziplock bag. 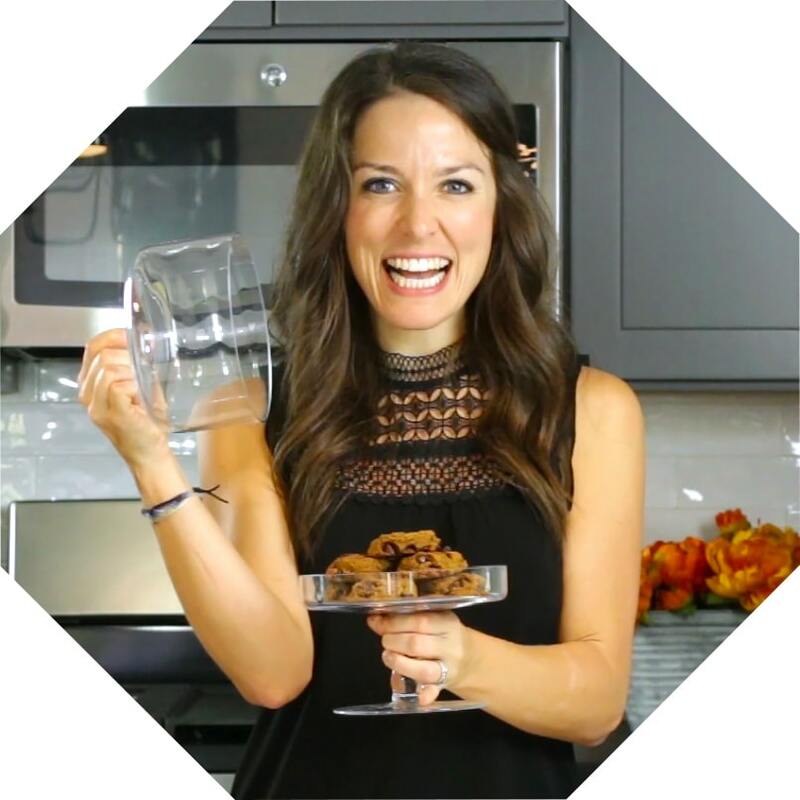 (You can also do this in two separate large bowls.). Divide the remaining sauce between the vegetables and toss to coat. Spread potatoes in an even layer around the chicken breasts and bake in preheated oven for 17-20 minutes. Serve immediately with additional black pepper and lemon zest. Enjoy! You can also use agave nectar or maple syrup in place of the honey. 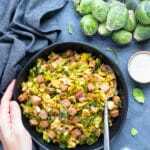 Feel free to experiment with different potatoes or other vegetables such as broccoli or cauliflower. Sheet pan dinners are the best for using up extra vegetables. Excited to try this one!